We do not know the exact age of the universe, but we believe that it is around 13 billion years - give or take a few billion. Astronomers estimate the age of the universe in two ways: (a) by looking for the oldest stars; and (b) by measuring the rate of expansion of the universe and extrapolating back to the Big Bang. One way astronomers estimate the age of the universe by studying globular clusters. Globular Clusters are a dense collection of roughly a million stars. Since all of the stars in a globular cluster formed at roughly the same time, they can serve as cosmic clocks. This way of estimating the age of the universe is based on our understanding of the life cycles of stars. The life of a star depends upon its mass. High mass stars are much brighter than low mass stars; they rapidly burn through their supply of hydrogen fuel. A star like the Sun has enough fuel in its core to burn at its current brightness for approximately 9 billion years. A star that is twice as massive as the Sun will burn through its fuel supply in only 800 million years. A 10 solar mass star, a star that is 10 times more massive than the Sun, burns nearly a thousand times brighter and has only a 20 million year fuel supply. Conversely, a star that is half as massive as the Sun burns slowly enough for its fuel to last more than 20 billion years. So if a globular cluster is more than 10 million years old, then all of its hydrogen burning stars will be less massive than 10 solar masses. This implies that no individual hydrogen-burning star will be more than 1, 000 times brighter than the Sun. If a globular cluster is more than 2 billion years old, then there will be no hydrogen-burning stars more massive than 2 solar masses. 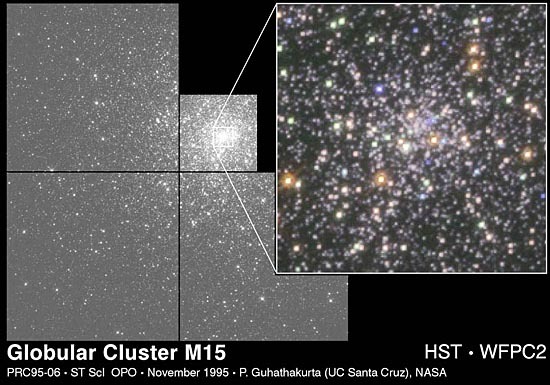 Hubble Space Telescope image of the Globular Cluster M15. The zoom-in shown in the upper right shows that the core of the cluster is composed of many, many stars. The oldest globular clusters contain only stars less massive than 0.7 solar masses. These low-mass stars are much dimmer than our Sun. This observation suggests that the oldest globular clusters are between 11 and 18 billion years old. The uncertainty in this estimate is due to the difficulty in determining the exact distance to a globular cluster and in our ignorance of some of the details of how stars evolve. An alternative approach to estimate is the age of the universe is to measure the "Hubble constant". The Hubble constant (H0) is a measure of the current expansion rate of the universe. Cosmologists use this measurement to extrapolate back to the Big Bang, the explosion which occurred at the start of the known universe. This extrapolation depends upon the current density of the universe and on the composition of the universe. If the universe is "flat" and composed mostly of ordinary matter, then the age of the universe is 2/(3 H0). If the universe has a very low density of matter, then its extrapolated age is larger, 1/H0. If the theory of General Relativity is modified to include a cosmological constant, then the inferred age can be even larger. Many astronomers are working hard to measure the Hubble constant using a variety of different techniques. They sometimes refer to their work as trying to determine the "curvature" or "shape" of the universe. As seen in the graphic below, this "shape" tells us about the age of the universe. Recent determinations of the value of the Hubble Constant are resulting in an ever-narrowing range of values. An international team of scientists led by Dr. Wendy Freedman of Carnegie Observatories in Pasadena, Calif., used the Hubble Space Telescope to look at several kinds of distant objects. Her team determined a Hubble Constant value of 73, which translates to a universe 9 to 11.5 billion years old. A second team of scientists led by Dr. Allan Sandage, also of Carnegie and also using HST, looked at distant exploding stars and determined an H0 value of about 58 - or a universe 11.5 to 14.5 billion years old. If we compare the various age determinations, there is a potential problem. If the astronomers who estimate that 1/H0 is as small as 10 billion years are correct, then the age of the universe would be less than the age of the oldest stars. This contradiction implies that either the Big Bang theory is incorrect or that we need to modify the theory of General Relativity or that we need to change our beliefs about stellar evolution. Most astronomers believe that this crisis will pass as soon as our measurements improve. Although the numbers are still very uncertain, the different data sets are starting to converge at an age for the universe of about 12 to 13 billion years. UPDATE! Measurements made by NASA's WMAP spacecraft have shown that the universe is 13.7 billion years old, plus or minus about 130,000 years. They were able to do this by making detailed observations of the fluctuations in the cosmic microwave background and using that information in Einstein's Theory of General Relativity to 'run the clock backwards to time equal zero'.